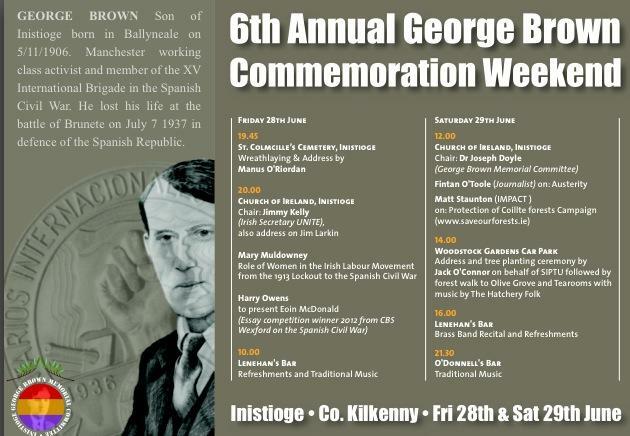 On Friday and Saturday, June 28/29 the Sixth Annual George Brown Memorial Event will take place in Inistioge Co. Kilkenny. The emphasis this year is very much on events in Ireland, both historic and current. On Saturday, in the Church of Ireland, Inistioge, ‘Irish Times’ journalist and the paper’s Assistant Editor, Fintan O’Toole, the key-note speaker will talk on the effect of the Troika-imposed austerity programme on this country and how the people can regain control over their own destiny. He has written extensively on this austerity programme and on the devastating damage it is inflicting on those least equipped to withstand it – the unemployed, the disadvantaged, those depending on the State Health Service, those on the minimum wage, those suffering financially due to ‘negative equity. 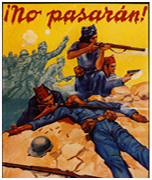 This is a subject which he has dealt with in detail in a number of publications, the most recent of which is titled “Enough is Enough – How to Build a New Republic”. Also at the Saturday session, which begins at noon, Matt Staunton of IMPACT will speak on the threat to the State forestry company Coillte arising from government plans to privatise certain commercial concerns in the State sector. This is a topic which will be of particular interest to many in our community. As part of the country’s deal with the I.M.F. 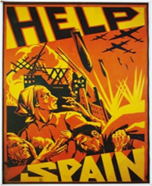 and the E.C.B. it was agreed that unspecified State assets would be sold off with the proceeds applied to the reduction of national debt. It is expected that these sales will realise€3 billion. The immediate sell-off targets are the State’s 25% share in Aer Lingus, part of Bord Gáis Éireann, and, possibly, Coillte. All who are familiar with Inistioge will fully appreciate how important forestry is to this part of Co. Kilkenny. Forestry is in fact the oldest State-owned/State-supported public enterprise in Ireland. Dating back to 1923, it pre-dates Irish independence. At present there are about 650,000 hectares of forest under State control. Currently Coillte harvests over 1.5 million cubic metres of timber annually, and sells a further 800,000 cubic metres standing. It is by far the leading producer of timber in the country and, besides its own processing plants, it also supplies 80% of the timber required by the country’s private saw mills. This is a commercially successful State enterprise. In 2011 its turnover was €260 million, generating a profit of just over€19 million. The sale would threaten not only the indigenous Irish forestry industry and the jobs it provides in local rural communities, but would also have serious implications for the important role our State forests have as a leisure amenity. The Friday evening session will concentrate, in this the centenary year of the 1913 Dublin Lock-Out, on the rise of the Irish trade union movement. Chair, Jimmy Kelly, Irish Secretary UNITE, will speak on Irish workers’ leader Jim Larkin. 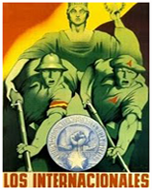 Labour historian, Mary Muldowney, will address the issue of the role of women in the workers’ struggle, drawing in the main, not on historical documents because women were to a great extent without a documented history, but on their recorded memories. This evening session will finish with a reading by Eoin MacDonald, a student at Wexford CBS, of his prize-winning essay on Wexford International Brigader, Peter Daly. This year’s event begins with a wreath-laying ceremony at the George Brown plaque in St Colmcille’s graveyard where the welcome address will be delivered by Manus O’Riordan, son of International Brigader, Michael O’Riordan. The final commemorative event will be held in Woodstock on Saturday afternoon. Following a short forest walk from the Olive Grove to the car park, where a tree planting ceremony will take place, an address dealing with IT&GWU and its hundred year history will be delivered by Jack O’Connor, President SIPTU. Afterwards, its back to the Square, Inistioge where entertainment will be provided by the Graiguenamanagh Brass Band. This entry was posted in Events, News and tagged Co. Kilkenny, Commemoration, George Brown, Inistioge. Bookmark the permalink.